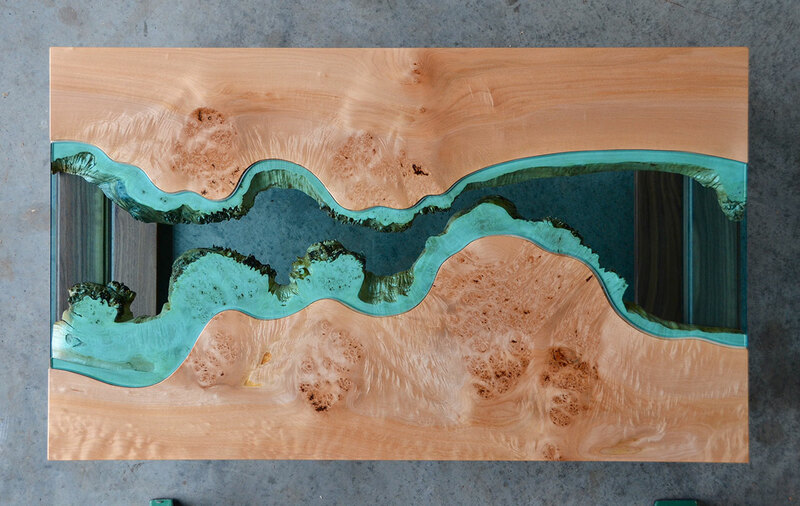 American artist and designer Greg Klassen loves nature. 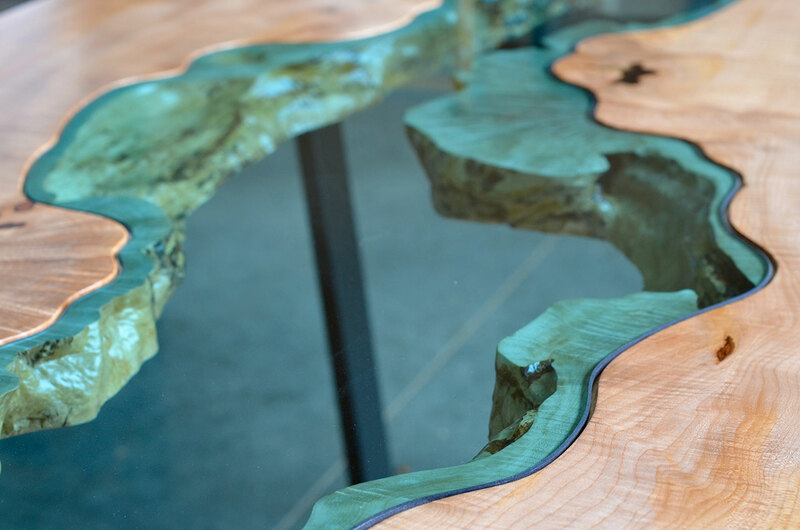 Don’t just take our word for it, or the fact that he lives and works among raspberry fields in a two-acre rural property in the Pacific Northwest, have a look at his River Collection, a series of tables and desks inspired by actual landscapes of his home state. 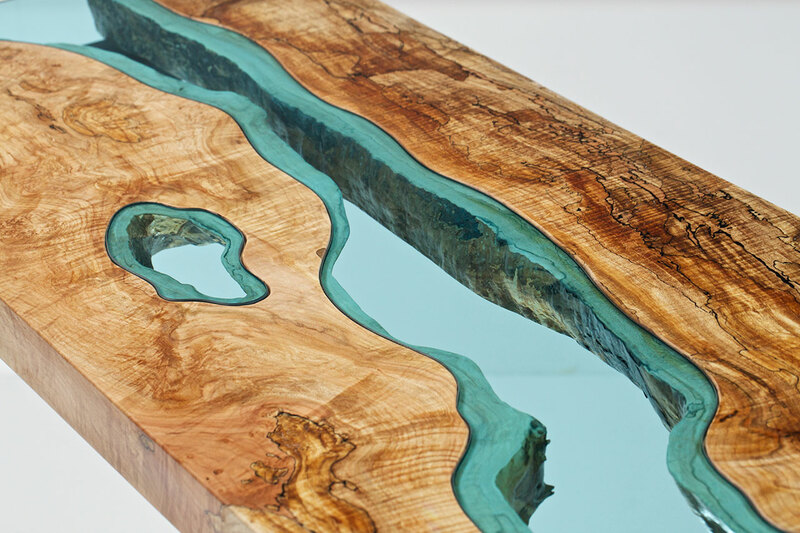 Hand crafted from single slabs of wood and featuring blue-tinted glass inlays, his one-of-a-kind topographical pieces give off the impression of observing lakes and rivers from above. 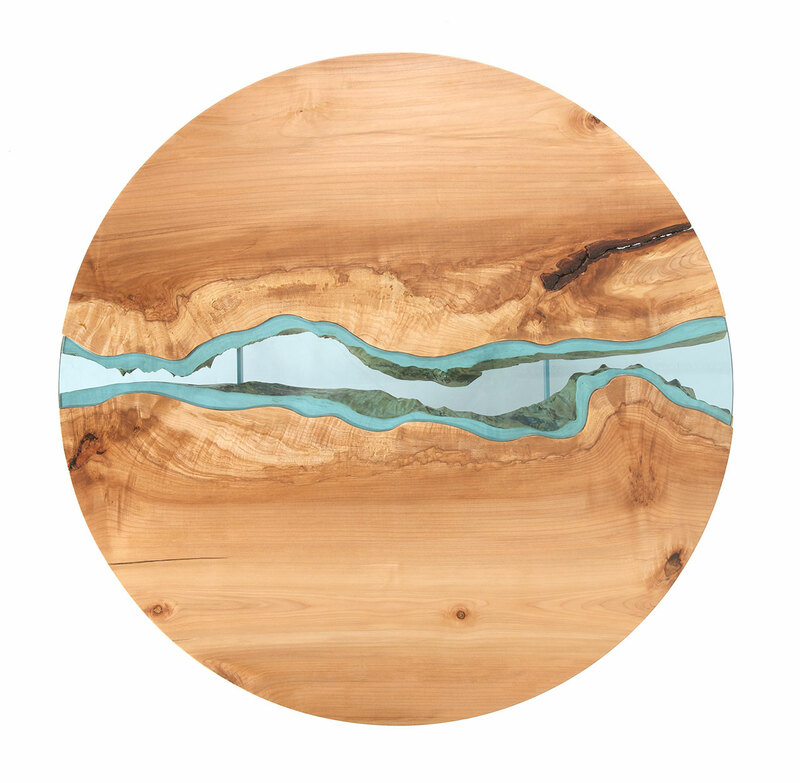 With an expanding collection, that also includes wall-hung decorative tableaus, Klassen’s work evocatively reflects both his design craftsmanship and artistic creativity as well as physically embody the grandeur of nature. 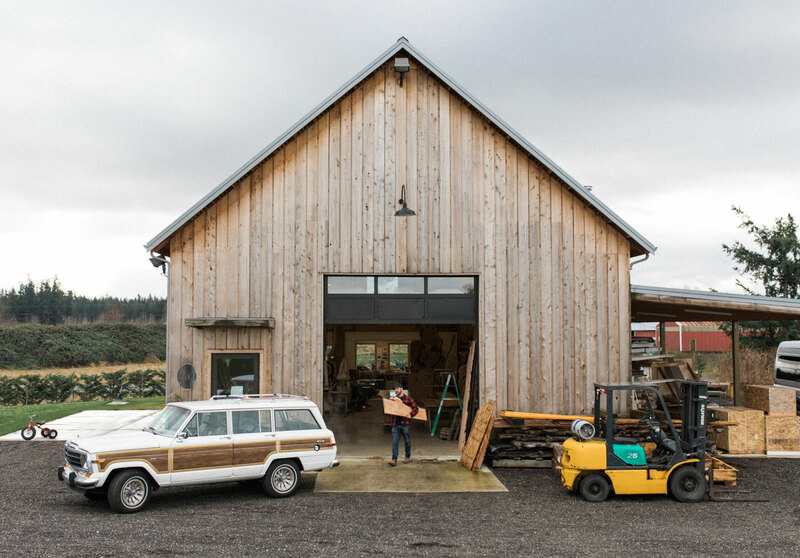 After studying furniture design and fine woodworking in such diverse locales as California’s redwood coast and an island village in Sweden, Klassen settled down in rural Washington State where he is raising his three young children and working on his craft, two activities frequently intertwined as his home-schooled kids often ride their bikes through his studio or pay impromptu visits to play with the resident kittens. 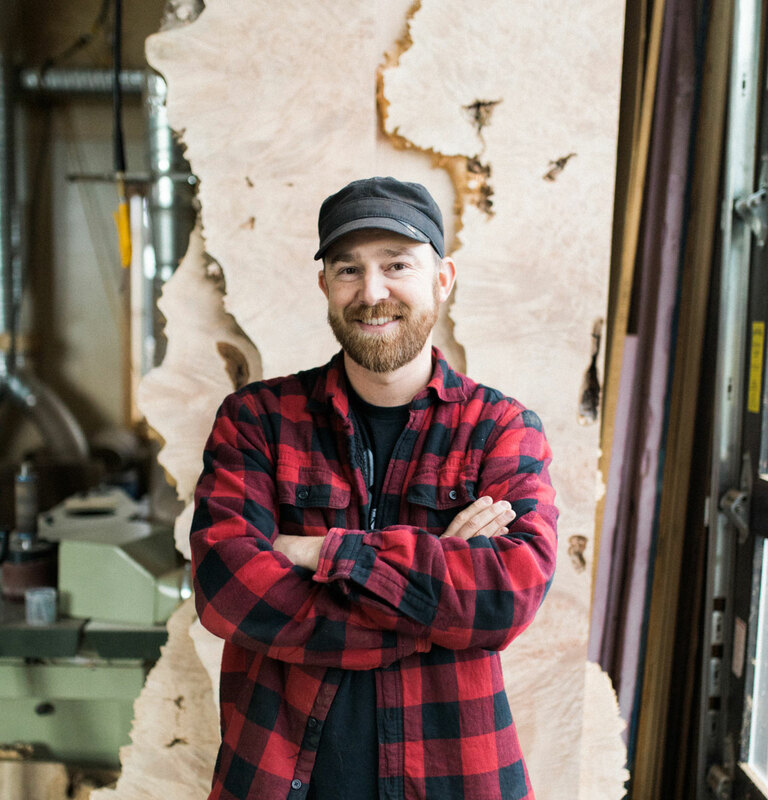 Klassen creates his artwork with the same dedication and affection he dedicates to his growing family. 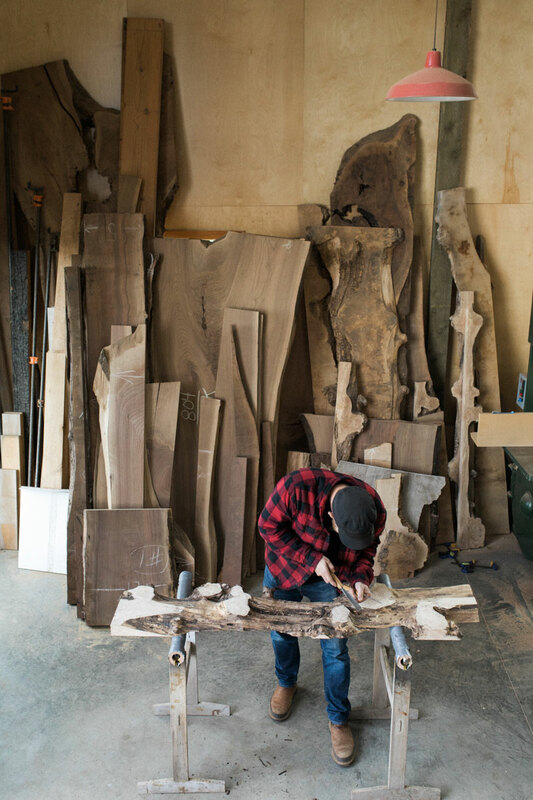 Every year he inspects thousands of salvaged wood slabs sustainably sourced from small independent sawyers of which only a very small fraction makes the cut. 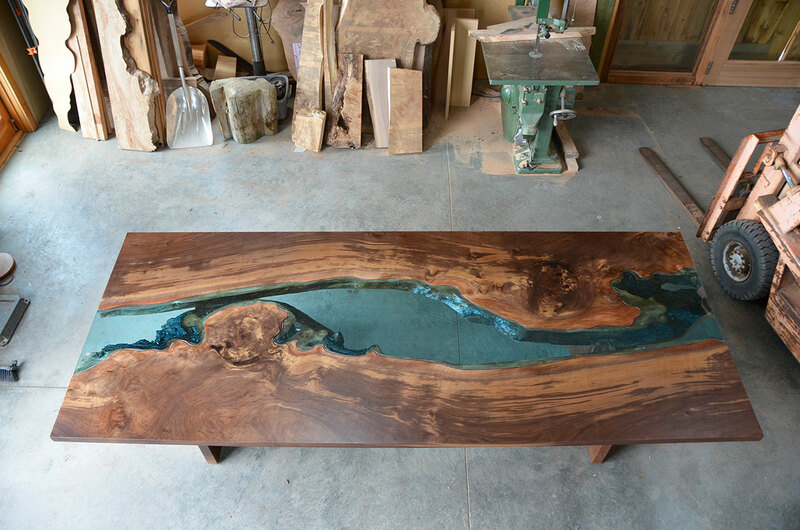 He then spends anywhere from several days to several weeks hand-crafting the wood into a unique sculptural piece that retains the charm and character of the natural material. 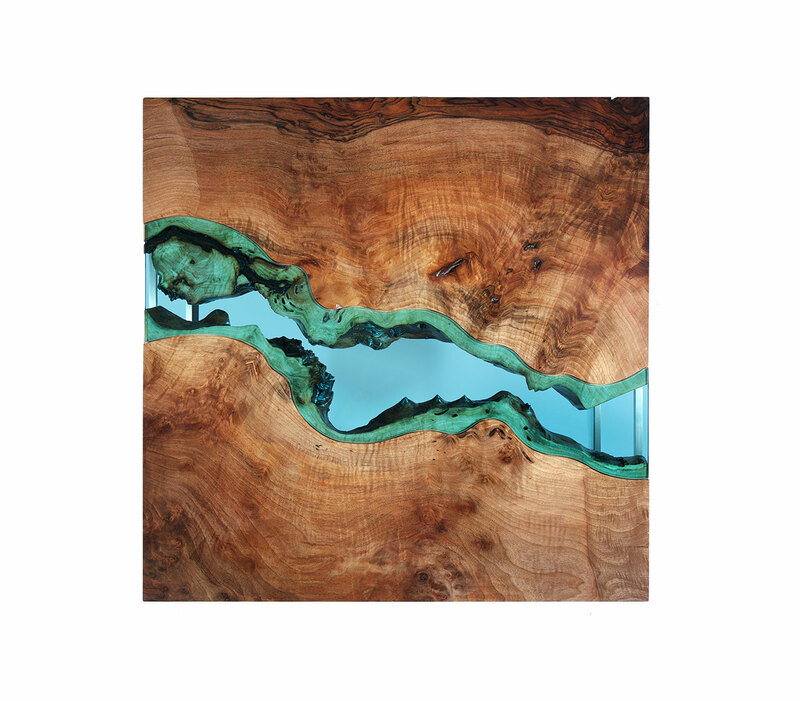 In his own words, his aim is to “coax out the beauty that I find in the material”. 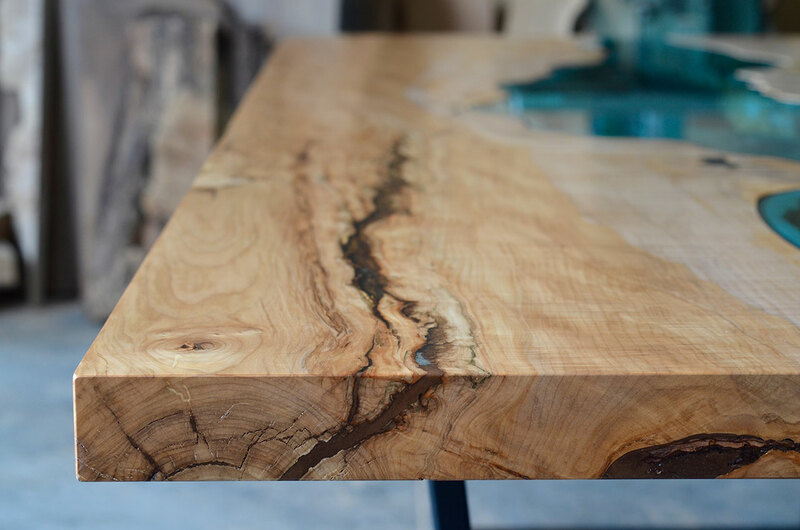 And indeed, the wood’s organic growth rings and idiosyncratic imperfections perfectly represent the natural formations of the landscape. 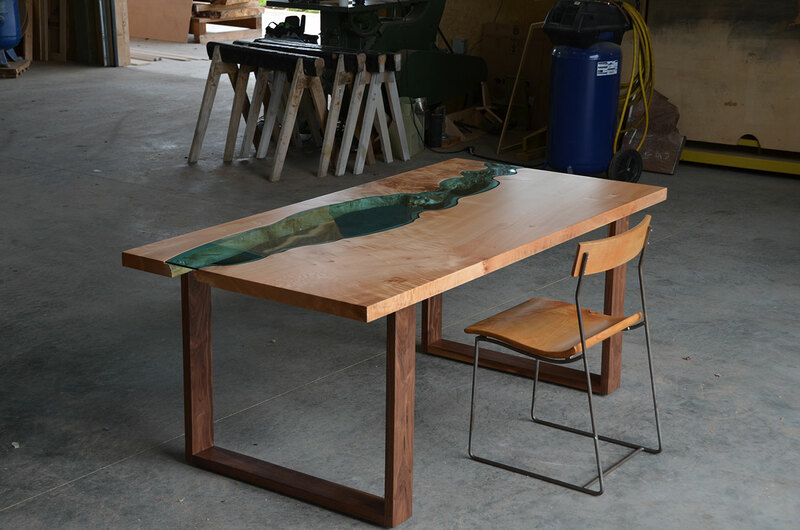 As he works on the piece the shape of the river or lake evolves and the final design is always in harmony with the organic features of the slab. 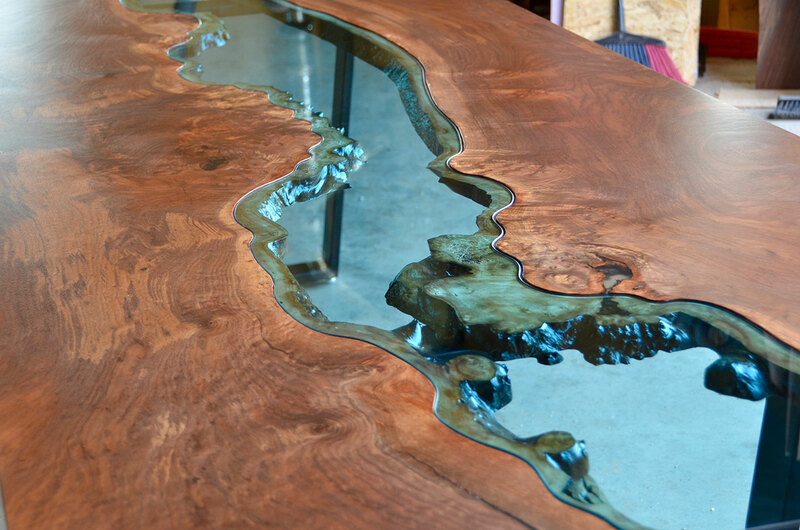 Finally, tinted glass is cut by hand to fit the wood’s sinuous cut-outs, a procedure that requires a great amount of skill and patience. It’s a very demanding and painstaking process but it’s worth it both for the aesthetic result and the sense of accomplishment. 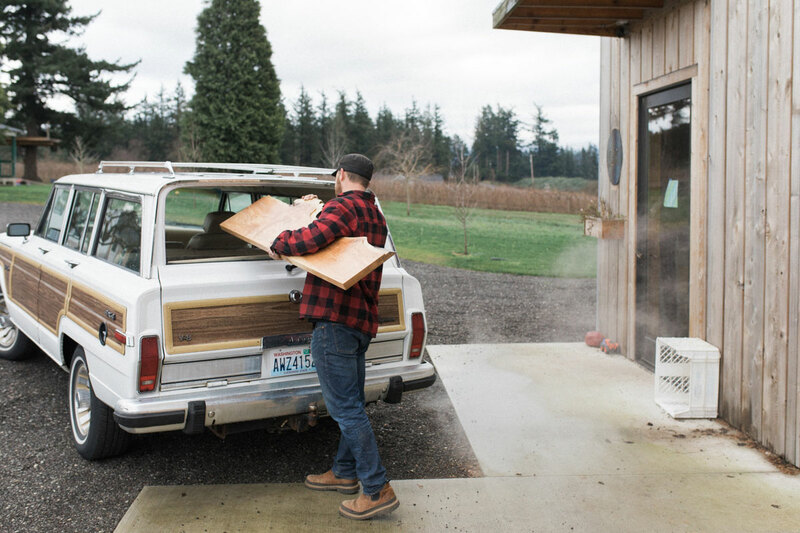 As Klassen says, “I love the idea of taking a discarded tree and giving it new life”. 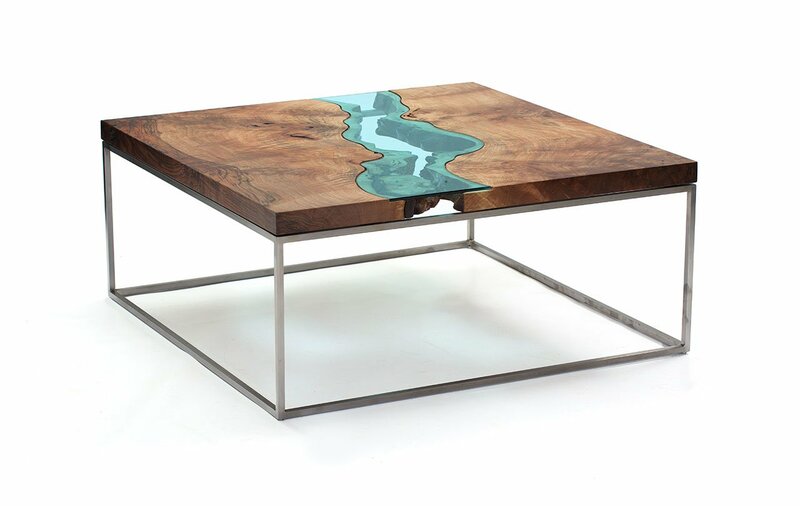 The River Collection pieces, which range from dining, coffee and side tables to desks and wall-hang artworks, look as sumptuous as they sound: Walnut Pond Desk, Maple and Black Walnut River Coffee Table, Chocolately Claro Dinner Table, and Big Leaf Maple River Console, to name a few. 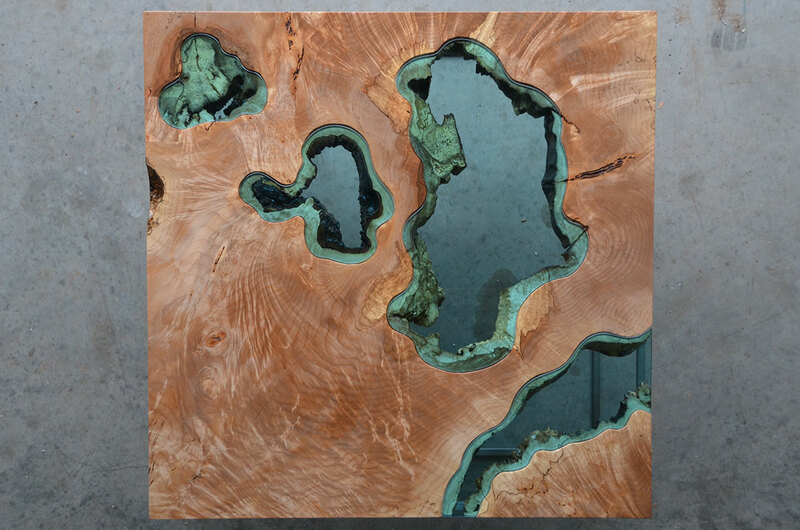 These pieces will soon be complemented by Archipelago, a new island shaped series that Klassen is working on with presumably the same originality, pathos and artistry he is known for. 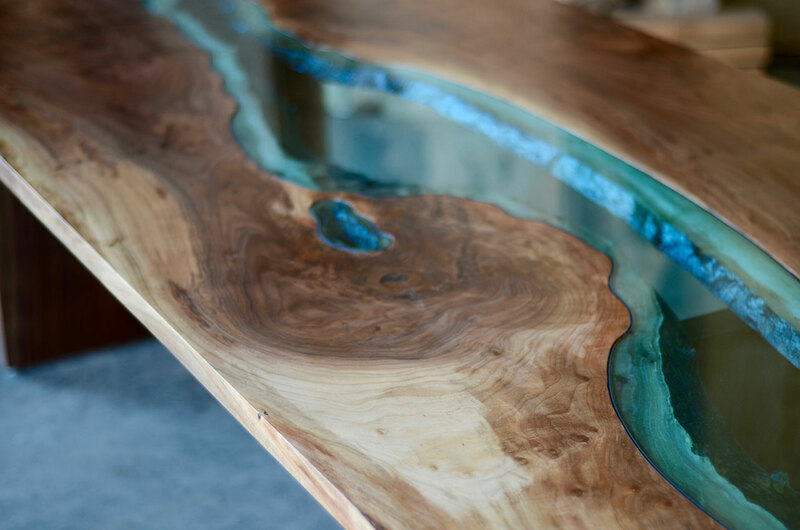 Round River Coffee Table, extraordinary maple slabs, textured live edges, hand-cut blue glass, silky smooth finish, 38" diameter. Photo © Greg Klassen. 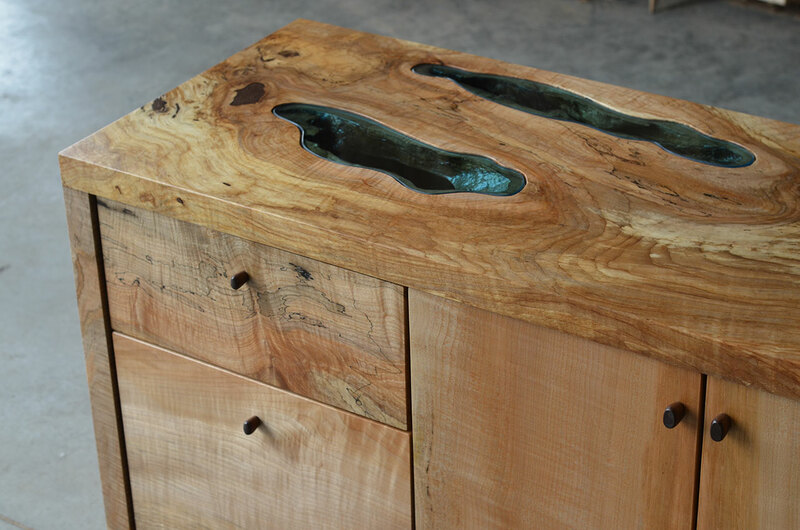 Spalted Maple River Console (detail), richly-colored spalted maple slabs, modern black steel legs, hand-cut blue glass, silky smooth finish, 49" x 18" x 32". Photo © Greg Klassen. 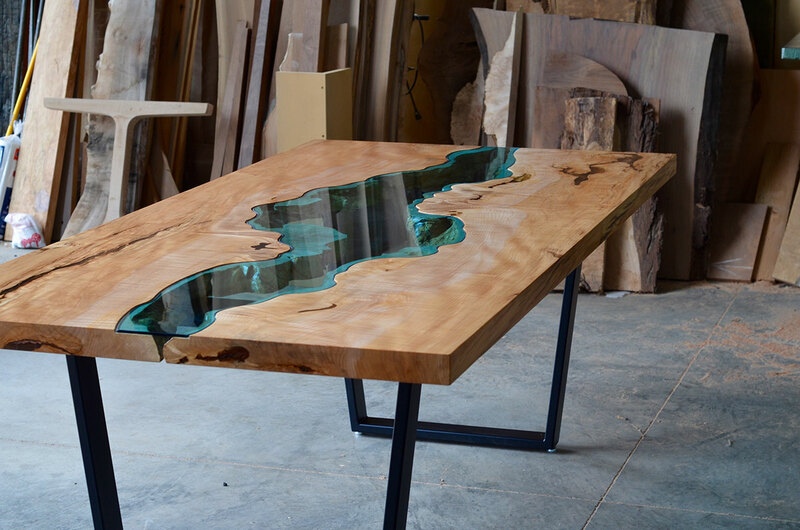 Spalted Maple River Console (top view), richly-colored spalted maple slabs, modern black steel legs, hand-cut blue glass, silky smooth finish, 49" x 18" x 32". Photo © Greg Klassen. 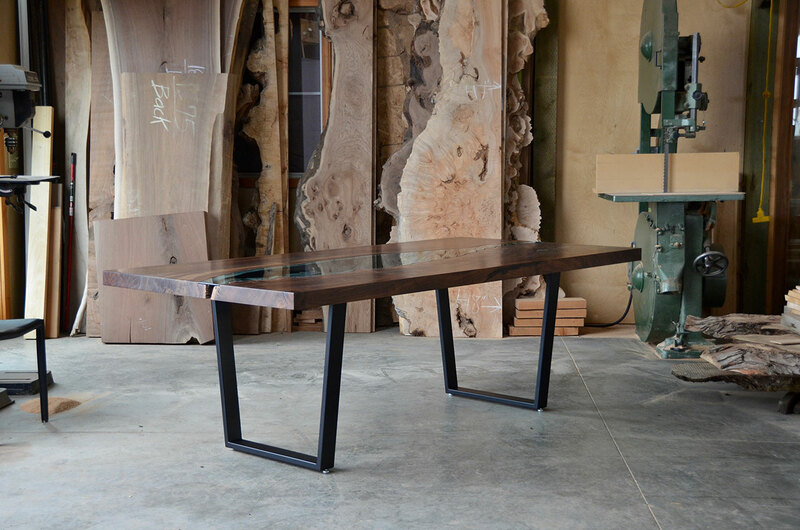 Walnut River Hall Table, wonderfully-textured walnut slabs, dark walnut legs, hand-cut blue glass, silky smooth finish, 30" x 16" x 32". Photo © Greg Klassen. 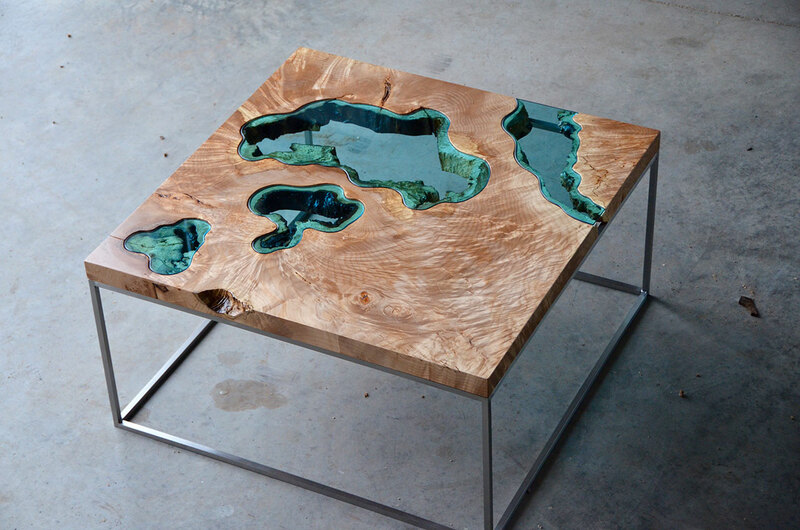 Square Walnut River Coffee Table, natural, modern coffee table, claro walnut burl, stainless steel base. 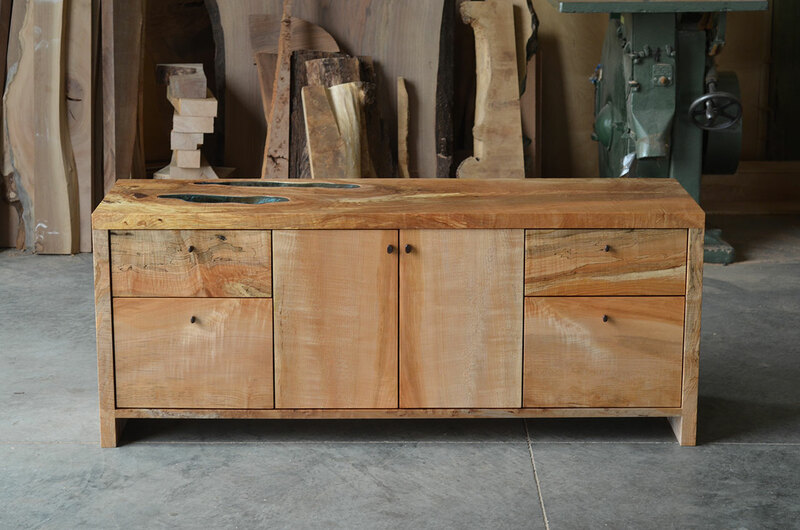 One of a kind, 33" x 33" x 16". Photo © Greg Klassen.